Written by Scott Joseph on 30 October 2009 on 30 October 2009 . The second thing you’ll notice is likely to be Stefano himself, although no one, apparently, calls him that. Even fewer call him by his full name, Stefano Tedeschi. It’s Chef Steff to everyone, and his is a formidable presence. 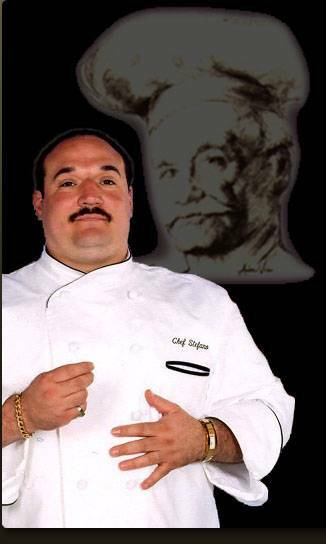 Think James Gandolfini in a chef’s tunic. And he’s not kidding about his scratch kitchen. The menu ranges from the simple to the complex, and from authentic to stylistically creative. Take, for example, the rigatoni Bolognese, a hearty dish of short, fat tubes of pasta tossed with a tomato sauce tinged with cream and loaded with meat, all dusted with freshly grated parmesan cheese. Compare that to the meat of a lobster tail, removed and pounded in the manner of a scaloppine, drenched in egg wash and sauteed with lemon, butter and capers. Served with the empty shell on the side, it was a deliciously creative twist. Other highlights from a recent menu sampling included a gorgeous crab cake, mostly jumbo lump meat with just a bit of egg and panko to bind it, served with a totally superfluous aioli. And little balls of fresh fried mozzarella wrapped in a thin slice of salty prosciutto. Wonderful bite-sized morsels. Salad lovers will want to try Mary’s Table Side Chop, named for Tedeschi’s wife. The salad has mixed greens and 10 ingredients ranging from salami to hearts of palm. For dessert there’s chocolate cake or coconut cake (have the latter), the omnipresent tiramisu or mini cannoli with a creamy filling. Mary also serves as hostess for the restaurant, leading a crew of amiable young servers. But make no mistake, this is Chef Steff’s domain, and he rules it well. By the way, it should be mentioned that this restaurant is not related to the Stefano's in Winter Springs. Stefano's Italian Grille is located at 13424 Summerport Village Parkway, Windermere. The phone number is 407-877-7833. Visit the restaurant's Web site for other details and to see a menu.